Create a Fish Feeding Frenzy, a Chumming attachment for any Remote Control Boat…. Want to attract fish to your hook? Here’s the sure fire way to lure them with a free fish food buffet! Fishing is similar to hunting in many ways, right? Hunters dump a bushel of apples or corn in the woods to attract deer to their hunting spot. Eventually the deer find the bait and will go there every day to feed expecting a free meal. Little do they know that on opening day they will succumb to the hunter’s arrows in an epic ambush at the bait pile. There’s no big difference, for Bluegills, Bass, Catfish, Pike, Carp….fish are always on the prowl for a free meal, and can be baited to a hook too. Anyone that’s ever thrown a hand-full of breadcrumbs from their dock knows this secret to attracting fish. Chumming or baiting for fish was done hundreds of years ago. Hundreds of years ago they didn’t have the sophisticated equipment we have today, but their method was effective for attracting fish. The thinking was if you could catch a fish with a worm or bug on a hook couldn’t you attract a bunch of fish if you threw a bunch of worms or bugs in the water? Of course! The early fishermen would take the rotting corpse of an animal and hang it from a tree limb overhanging the edge of the water. In a short time the flys lay eggs on it, the fly eggs, (maggots) fall off the rotting animal and the fish come to find the source of this free food. Although that would work today there are easier ways and specialized equipment to create a very productive fishing spot. Hundreds of years ago they didn’t have the sophisticated equipment we have today, but their methods were effective for attracting schools of fish. Whether freshwater fishing or saltwater fishing there are easy recipes to start chumming. If you’re fortunate enough to have a fishing spot and want to attract big fish to the spot then you are a good candidate to try a bait boat. This fishing (chumming) technique is known by fishermen throughout the world, the only thing is the methods have changed. Today most sporting goods stores sell small bags of pre-made chum for freshwater fishing and saltwater fishing, and homemade recipes for chum you can make with regular kitchen ingredients are as close as clicking on youtube. Bait Boats come in many different models and have various features. Bait boats just haven’t gained the same popularity here in the USA as they have in the UK, and Europe. The term chumming gives you the idea here in the USA that you are dumping dead fish and fish blood out in the water to attract sharks. In the UK and Europe, Bait Boats are commonly used for attracting big Carp and Pike. The picture below should give you an idea of just how many options there are when it comes to looking to buy one of these remote control bait boats. Maybe have never even heard about fishing with a remote control boat. With modern technology it was a matter of time, now we have Rc Fishing Boats, and Bait Boats. . If you want a Bait Boat plan on a pretty big investment of hundreds of dollars. The specialized Bait Boat has many features in fact maybe too many features. For someone that wants to try chumming are there any other options? Fish Fun Co. is set to announce their new “Bait Bucket Fishing Attachment for Any Rc Boat”! That’s right, Fish Fun Co., known for introducing us to fishing with remote control boats and “The Rc Fishing Pole”. For under $20 bucks you can clip the “Bait Bucket” on “The Rc Fishing Pole”. Benefits of the “Bait Bucket” the options for remote control fishing are much broader. Bait Boats are generally only able to deliver a portion, anywhere from a cup or two to a few pounds of chum and release it at a specific spot in the water where you want. With an Rc Fishing Boat the main feature is to take your line out or to pull in fish with the boat. With “The Rc Fishing Pole” and “The Bait Bucket” you get the best of both worlds and at a fraction of the price. Drive a Portion of Chum and Release it hundreds of feet out. Drive line from a fishing pole and baited hook with the chum and release it all in one spot. Drive the line from a fishing pole with a lure, put a lure in the “Bait Bucket” and Release it hundreds of feet from shore. Attach a line, bobber, and baited hook on the end of “The Rc Fishing Pole” for small fish and drive them in with the boat. The total cost for a Fish Fun Co. Rc boat with “The Rc Fishing Pole” and the “Bait Bucket” is under $100 plus shipping. Remote Control Fishing Boats are for Girls too! It wasn’t hard, my daughter loves catching fish! We did a video of her and her friend fishing with the new Fish Fun LuckyStrike RC Fishing Boat. It’s hard to teach the kids to cast, so they jumped at the opportunity to try fishing without casting. As a matter of fact, the kids these days are automatic professionals when it comes to anything with remote control. My daughter has tried every game out there so I didn’t have to teach her how to operate the boat at all. Uncle Don came by and hooked the fish and let the girls bring in the fish with the boat. Summers in Michigan fly by so any chance I can get I try to involve her in things I like to do, especially if it’s outdoors! I’m sure we’ll do this again next year when it warms up again. The "Bass Pro" will get you excited again about catching those hard to catch fish where you can't cast to! The “Bass Pro” will get you excited to go fishing! If you’re serious fisherman, or looking for a way teach you kids about fishing, or maybe you just want to have fun, rc boats take fishing to a whole new level! 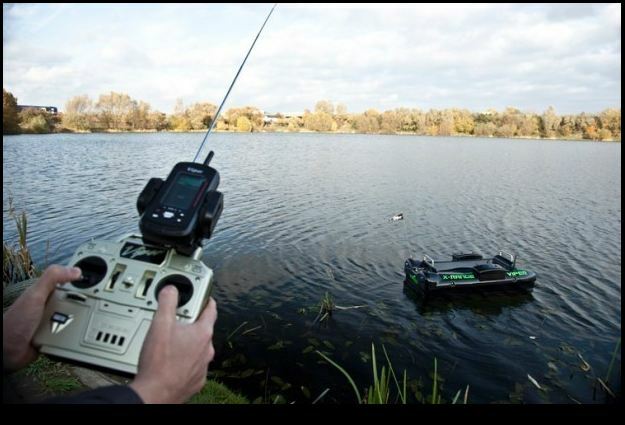 Let’s assume you are considering fishing with a remote control boat, RC Fishing World is the authority! It’s the home of “The RC Fishing Pole”, and ready to run remote control fishing boats, from the 23″ Fishin Pal, to the 32″ Radio Ranger, and now, the new 29″ Ed Hardy! RC Fishing World is all about Rc Fishing Fun. RC Fishing World gives you 6 different boat choices too for the complete deal. Not just some throw-away toy boats, but hobby grade that will provide hours of r/c fun time! Plus there’s a style for everyone. Another great idea is “The RC Fishing Pole”, it means your boat choices to go fishing with are endless. With “The RC Fishing Pole” you can turn any Remote Control (r/c) Boat into a Rc Fishing Boat. It’s simple, peel off the paper and stick the mounts anywhere on your r/c boat, done! Attach your line and go fishing. From Bluegill to Large Mouth Bass the 23″” Fishin Pal”,is going to get it done! Drive the Fishin Pal around the dock, around the shore, 100 foot range. Leave your line on the boat and drive it around until you get a hit, or drop the line at your favorite spot. Fishing with Rc Boats is fun, but it’s also a great way to go fishing, you can get around obstacles in the water, fish places you can’t cast. For the sports fisherman, it has to be the 32″ inch “Radio Ranger”, it’s almost 3 feet long. The 32″ “Radio Ranger” Remote Control fishing boat. This is a one snazzy RC Boat for catching fish! The biggest rc fishin’ boat RC Fishing World has! Everything included, put it in the water, and go rc fishing! Ready to run. Boat comes with high-capacity 7.2v 1700mAh battery and charger. So you could have more fun in the water! Just attach “The R/C Fishing Pole” and go after the Fish!. The dual motors makes this boat runs at a very fast speed 20-25mph. The remote control radius is 250 to 300 foot. It has a V-hull and 2 x 380 size electric motor. It is completely ready to run and comes with everything. It’s time to catch some fish with a remote control fishing boat and have some fun in the water, at a very affordable price. So if your looking to take the kids out for a fun day of fishing, or looking for the perfect gift for the fisherman that has everything, RC Fishing World has a a bunch of Remote Control Fishing Boats! Fish Fun’s RC Fishing Boats will bring out the excitement like that feeling the first time you went fishing! FISH FUN Co. Video Rebate Summer Deal! Got a Ham in the family? Fish Fun Co. is going to send you up to $25 back for your RC Fishing adventure! Video Money Back Rebate Offer! Send us your video fishing with a FISH FUN Rc Fishing Boat and get $25.00 cash back from fish fun co! or Upload your RC Fishing Video on YouTube, or email us your pictures! LOOK FOR AN ANNOUNCMENT FOR THE FISH FUN CO. FREE DRAWING AND YOU CAN WIN AN RC FISHING BOAT FROM RC FISHING WORLD!